This Mike Todd production was a star-studded, multi-million dollar extravaganza when first released in 1956. It remains enjoyable family fare, but time has somewhat dulled its shine. Still, it compares favorably to the overly long, TV mini-series starring Pierce Brosnan and Eric Idle. Elegant David Niven plays the neurotically punctual Phileas Fogg, a British gent who is spurned on by a wager to prove he can travel around the world in 80 days. He is accompanied by his valet, played with persnickety humor by Cantinflas. There's a famous old saying to the effect that "It's a difference of opinion that makes horse races." Present-day critics often look askance at "Around the World...," yet when it came out, it earned the plaudits of almost every critic then in existence, and was nominated for eight Oscars (including Best Director), winning five, including Best Picture. This may simply indicate a change in movie tastes on the part of critics over nearly 40 years, but I still consider it to be one of the most purely enjoyable examples of family viewing yet to appear on video. Of course, everyone knows the basic premise of the film: Phileas Fogg (Niven), "the most punctual man alive," bets a group of fellow clubmen (staking his entire fortune) that he can circle the world in 80 days, and then, accompanied by his valet Passepartout (Cantinflas in his first U. S. film), sets out to do just that, along the way rescuing an English-educated Parsee girl, Aouda (MacLaine), from forced suttee and attracting the attention of Scotland Yard's Insp. Fix (Newton in his final role), who is convinced he is the man who robbed the Bank of England on the day before his departure. This was the first and last film produced by Mike Todd (then married to Elizabeth Taylor), who was killed two years later, and for a first effort--indeed, for any effort!--it's astounding. Todd believed in going all out, and he surrounded himself with the best talent he could find, even going so far as to cast major film figures in minor parts, inventing along the way the now-familiar term "cameo role." The film was actually shot in large part on location, requiring a huge crew and many cast members to travel untold thousands of miles and using what was literally "a cast of thousands." (Of all the exterior scenes, only two were observably shot on indoor sets.) To be sure, it loses something through translation to the small screen, but the scenery is still beautiful and the actors still strut their stuff to good effect. In a movie of this length, pacing is everything, and the pace of "Around the World..." is consistent and steady. True, it's a little slow getting started, as it introduces Fogg and his Club, but after a few minutes it cuts to Passepartout on a "pennyfarthing" bicycle, and from then on there's always something going on or something interesting to look at: Cantinflas's bullfight in Spain, the balloon trip over the French countryside, the drugging of Passepartout in Hong Kong, the Japanese circus, and the stripping at sea of the sidewheeler Henrietta, to say nothing of the mere presence of Cantinflas, who adds a touch of comic lightness to what might otherwise be a rather taut film; the costumes, the vehicles, and the incidental characters, especially Sir Cedric Hardwicke as Gen. Sir Francis Cromarty, Red Skelton as the gluttonous drunk in San Francisco, John Carradine as Col. Proctor, and Joe E. Brown as the Fort Kearney stationmaster. The credits at the end are difficult to read unless you have a giant-screen TV, though the imaginitive treatment is worth sitting through. And viewers of all ages will enjoy the sheer suspense of "What-will-happen-next?" --which is, of course, what makes a story a story. The more penetrating viewer may also find it interesting to watch how Fogg develops: though he maintains almost to the end that he is a man of the most precise habits and has no human warmth to speak of, there are cracks in his armor--a moment's appreciation of a sunset over the Arabian Sea, his compassionate resolve to rescue Aouda (and his nervous lick of the lips when she seems unsaveable), his reassuring pats to Passepartout's shoulder as their journey passes midpoint and things pile up in their path. You will probably prefer to fast-forward through the prologue, featuring Edward R. Murrow giving an introductory talk, but once the movie itself gets under way, S. J. Perelman's inspired mix of action, humor, and suspense should hold everyone's interest. The worst Best Picture winner ever??? First off, let me explain why I purchased the AROUND THE WORLD IN 80 DAYS DVD in the first place, sight unseen. One, I was trying to collect as many notable films of the 1950's as I could on DVD, to add to my personal library. Two, it was the winner of the 1956 Best Picture Oscar (how bad could it be, right?). And third, it was on sale at my local wholesaler. So I figured, what the hey, I'll take a chance. Talk about a COLOSSAL disappointment. I'm a huge movie buff. I'm only 32 years old, but I love all sorts of films and genres from different periods and countries. I love old black & white and silent films, and I don't shy away from foreign films either. I'm also a huge fan of Warner Brothers' 2-Disc Special Edition DVDs. I try to keep an open mind about all the films I see, but I just can't come up with any convincing arguments to either buy or watch this film/DVD. To start, there is NO GOOD REASON why this film should be 3 hours long. It could have very easily been edited down to 2, if not 90 minutes. There is almost no script to speak of, and what little there is consists of trite exchanges and banter with barely 2 memorable lines of dialogue. There are endless shots of open seas or country, followed by about 30 seconds of dialogue, followed by EVEN MORE endless footage of different locales. There is no real drama or comedy going on to drive the film, and the pacing is absolutely DREADFUL... I found myself hitting the "fast-foward" button on my remote on more than a few occasions, simply because I knew I wasn't missing any dialogue and the establishing shots would go on for 1 or 2 minutes STRAIGHT! Secondly, the entire cast is virtually wasted. David Niven is always a delight to watch, but is never given a chance to make Fogg truly shine. He has one demeanor that he holds throughout: stiff and mannered, with little or no variation. Cantinflas, who supposedly was one of the highest paid comedians in the world at the time 80 DAYS was produced, gives us little reason to believe how or why he was such a sensation (other than doing his own stunt work). He's mildly amusing at best, and his accent is so thick and mumbled that I had to rewind and replay some scenes with the "subtitle" button on. As for the "noted" cameos... again, the actors/comedians are given little to do and barely play to their strengths and familiarity. The only cameo actor who stuck out as having any real performance or impact was the great John Carradine (can't miss that voice!). It's hard to believe it took THREE different writers to come up with such a frustratingly bland, lifeless and unfunny script (not to mention headscratchingly illogical... when Cantinflas rescues the Shirley MacLaine Princess character, wouldn't she fall in love with HIM, her actual rescuer, rather than the cool and distant Fogg, who only ordered the rescue? Talk about a missed opportunity for some genuine comedy!). Although this film obviously has some fans, I wonder if it's only because of some overriding nostalgia factor, whether it was seeing it for the first time back in 1956 or on TV as a child. Other than that, I can't understand how anyone could seriously recommend this film. Yes, it's beautifully photographed, and the costumes are great, but THAT'S IT. I can't believe that 80 DAYS won the Best Picture Oscar of 1956, a year that also gave us GIANT, THE TEN COMMANDMENTS, THE KING AND I, THE SEARCHERS... hell, even FORBIDDEN PLANET or INVASION OF THE BODY SNATCHERS should have won before this overblown moving postcard. I'm sorry to say that I probably won't bother watching this film again and will most likely end up reselling my DVD copy (if anyone will take it!). Certainly my most disappointing DVD purchase EVER. Don't say you weren't warned! Everything that could thrill audiences were thrown into this movie, as well as a bunch of cameo appearances from famous stars such as Buster Keaton, Frank Sinatra, and Trevor Howard. In fact, this is the first movie where the term "cameo appearance" was coined in the first place. There are more then twenty cameo appearances in "Around The World In 80 Days," though most of the people don't say anything, and where there just to get a reaction from the audience (Example: A salon player looks up from his piano long enough for us to see it's Frank Sinatra and then puts his head back down). Considering this film pioneered so many techniques we take for granted now, I can't say I completely hate this film. That said, "Around The World In 80 Days" is the dullest Best Picture winner you are most likely ever going to see. Not bad, dull. For all the techniques this film created, it is a shame the story itself is not more interesting. NO WONDER THIS PICTURE WON BEST PICTURE!!! The film stars many great stars and is renowned as the film that gave birth to the "cameo" appearence. It has David Niven as Phileas Fogg (The Sea Wolves (Keep Case)) and Catinflas in his first English speaking film as the French manservant Passpartout. Shirley MacLaine makes her second film as Princess Auida (her first being Alfred Hitchcock'sThe Trouble with Harry) and Robert Newton makes his last film as Inspector Fix (Return to Treasure Island). If those weren't enough stars it has Sir John Gielgud, Charles Coburn, Cesar Romero, Gilbert Roland, George Raft, Marlene Dietrich, Red Skelton, Charles Boyer, Ronald Coleman, Peter Lorre, Sir Cedric Hardwicke, John Carradine, Buster Keaton, Robert Morely and a plethora of many other great Character Actors and Silver Screen Legends. Anyone who enjoys classic films will love this beautifully restored film with many vintage documentaries, trailers, interviews and a introduction by TCM host Robert Osbourne as well as A Trip To The Moon (1902) which appears early in the film during a narration about Mans vast expansions in the field of science. If you don't like the film, I am sure you will still enjoy looking out for your favourite actor, like a Hitchcock film searching for the Master of Suspense. But I'm sure you will like the film as it has many twists, excitement and it is a classic story by Jules Verne. The great actors are just the icing on the cake. If you're looking for a steely-eyed, completely objective review of Mike Todd's 1956 blockbuster "Around the World in 80 Days," don't look here! As a very unsophisticated boy of 12 I saw this film in its first release, and though I'm long past being an innocent 12-year-old, its spell over me has never faded. I loved the story, and I thought the "twist" at the ending was wonderfully clever (it still is! ), but in 1957 it was the technical aspects of this movie that really blew me away--it was the first movie I ever saw in a super-wide-screen format, and the first I ever heard that was in stereophonic sound. Today, however, as I see ATWIED through adult eyes, the acting and the production values are what make it a great film for me. -Playhouse 90: Around the World in 90 Minutes (excerpts): Elizabeth Taylor hosts this live October 17, 1957 telecast of the a star-studded gala from Madison Square Garden celebrating the one-year anniversary of Around the World in 80 Days' world premiere. A traveloguethat hasn't aged as well as it might. This movie is a mixed bag. Where the actors are actually doing something, it is very entertaining. The many cameos of long-gone stars are delightful. But in-between are many minutes of beautiful scenery. A film treasure to be enjoyed no matter what the years is .. According to the Digital Bits, Warner Brothers will be releasing AROUND THE WORLD IN 80 DAYS in a 2-disc SE. The exact date is not known, but Warner representatives have said it is coming soon, with the prologue, intermission, etc. I will try to give you more details when I can! AROUND THE WORLD IN 80 DAYS is more a triumph of spectacle than of storytelling, with an extraordinary backstory of a master entrepreneur's decade-long dream to create the biggest, most extravagant entertainment ever made. That the film was ever produced at all was miraculous; that it succeeded so well (earning the "Best Picture" Academy Award, along with a raftload of other prizes), and remains the most enjoyable version of Verne's novel (far superior to the Pierce Brosnan and Jackie Chan remakes) is a living testament to it's nearly forgotten guiding spirit, Michael Todd. A STYLISH, STAR-STUDDED TRIP IN A STUNNING NEW TRANSFER! "Around The World in 80 Days" is producer, Mike Todd's lasting tribute to divine decadence circa 1950's film making. Keeping in mind that the decade produced one lavish, eye popping spectacle after the next in an attempt to win audience away from television, "Around the World in 80 Days" is a star-studded, over produced and overblown retelling of the classic story by visionary author, Jules Verne. Having stated the obvious, this film is also a lot of fun to watch. The story - in brief - concerns a bet made by Phileus Fogg (David Niven)to members of his men's club, that he can circle the world in 80 days and be back in England in time to collect his handsome wager. On this occasion, Fogg is ably aided by his man servant, Passepartout (Cantinflas)to whom Fogg entrusts most of the seemingly benign duties on their journey. Every one from famed Flamango dancer, Jose Greco, to sultry Marlene Dietrich make cameo appearances, which is part of the fun of this gigantic travel log with an attitude. Shirley McClaine plays a key role as an Arabian princess, whom Fogg befriends and brings back with him to England. Over all, good humor, great fun - if a bit stuffy at times - and carried off with overwhelmingly "splendiferous" showmanship. THE TRANSFER: In a word - marvelous. "Around the World In 80 Days" was filmed in Mike Todd's patented Todd-AO widescreen format. Superior to Cinemascope in just about every way, novices to the process may find the fish eye warping of vertical and horizontal lines a bit problematic to watch but this is as Todd envisioned the film to be seen. Warner Brothers gives us a near pristine print. After some unstable color during the film's overly lengthy introduction (delivered by no less of an M.C. narrator than Edward R. Murrow), and a rather faded montage of a rocket ship blasting into space, the rest of the film exhibits a stunningly pristine, vibrant and solid color scheme that is in keeping with the high resolution of the Todd-AO film process. Colors are rich, well defined and nicely balanced. Shadow, black and contrast levels are magnificently rendered. Several outdoor scenes exhibit a slightly soft characteristic, but this too is in keeping with the original photography. Edge enhancement is rarely present. Pixelization and shimmering of fine details is never an issue. The audio is remixed to 5.1 and offers a marvelous spread - particularly in the music. Dialogue is directionalized in several scenes to good advantage. Truly, this is one heck of a good visual presentation from Warner and it is to be commended on every level. EXTRAS: The film is divided into two parts across two discs, but, as the original roadshow engagement had an intermission, this break is forgiveable. Both discs contain a very thorough and engaging audio commentary. As well, on disc one we get to see George Melies' A Trip To the Moon (also based on a Jules Verne novel) in its full and uncropped version. The film elements have dated badly but over all, the image quality on this short film is to be expected. On disc two we get several extra features including an hour long documentary on Mike Todd that was produced in 1968 and narrated by Orson Welles. The color balancing on this documentary is POOR, with orange flesh tones and a considerable amount of grain, dirt and scratches throughout. We also get some edited clips from Playhouse 90 and the Academy Award ceremonies that are in poor condition but interesting to view from a historical perspective nevertheless. One of the Most Ambitious and Gorgeous Movies Ever Made! A spectacle in every sense of the world! - Cedric Hardwicke, the officer who finds happily a means of conveyance : to cross the deep jungle on an elephant! - Peter Lorre, the smiling Japanese steward who informs Passepartout that being broke without money in Yokohama... is catastrophic! At last! The original roadshow version in Widescreen format! I have been fortunate enough to get an early look at AROUND THE WORLD IN 80 DAYS via a friend who is a local DVD critic. Fans of this film who have eagerly awaited its DVD release will be truly thrilled. It's finally been restored to its original full-length roadshow version, and it looks and sounds marvelous. For a film that is nearly 50 years old, I think the folks at Warner have done a terrific job with the mastering. The images are clear and sharp, and the colors are about as good as you can expect from anything photographed in the Eastmancolor process during the mid-1950s. The colors are as satisfying as those found on other landmark films of the era, such as REAR WINDOW or THE TEN COMMANDMENTS. Happily, Warner has spread the film over two discs, and each disc is stuffed with extras. Of particular note to fans is a terrific documentary by Sol Zimmer (sp?) all about the film's producer, the inimitable Mike Todd. It's as fascinating as the film itself. Best of all is the lush Victor Young score, which is done great justice by the lovely 5.1 surround mix. Three and a half stars-Still a wonderful trip! 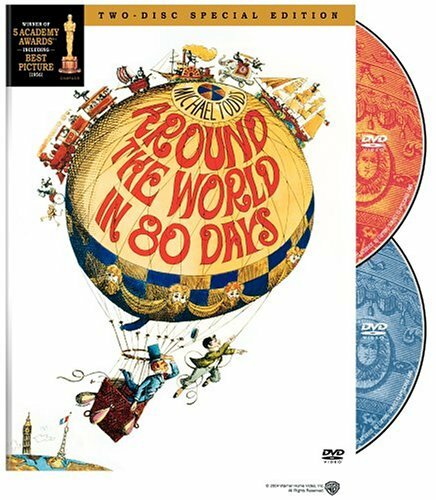 This review is for the new two disc DVD release of Around the World in 80 Days. The picture was a huge gamble for producer Mike Todd both financially and personally but it is one that paid off handsomely in spades.It won many,many accolades including the best picture OSCAR for 1956(five total). It is a veritable who's who of film actors from its lead characters of David Niven and Cantinflas to Noel Coward,Ralph Richardson,Ronald Coleman,Evelyn Keyes,John Carradine,Reginald Denny,Marlene Dietrich,George Raft,Victor McLaughlin,Peter Lorre,Buster Keaton(who looks very much at home as a conductor on a train in the old west being pulled by a locomotive of similar style as the 'General'),and many,many more. David Niven is a very Victorian,very stalwart and stiff-upper-lip Englishman who, immediately after taking on a new "man" played by famous Mexican/Latin American film star Cantinflas,decides to take a bet on that he can 'round the world in less than 80 days and the film takes us on that trip with him. Along the way we see some very spectacular locations and scenery as the cinemetography is top rate throughout. The film opens interestingly enough by Edward R.Murrows who introduces us to a replay of George Melies' 1902 film "A Trip to the Moon"(almost complete) then we get to see earth from the camera of a rocket which was sent up especially by Todd for use in this picture.This then all segues into the beginning of the "actual" picture. The picture I feel has lost a little of the punch it had back in 1956.It is a bit uneven throughout as it has its' weak moments(The Spanish dancing sequence)and strong moments(the rescue of the princess in India). Also as uneven as the film plays so is the film transfer which could/should have been done MUCH better than it was.The print itself is quite good and clear but there are many places throughout that need "cleaning" of the light streaks and blotches that appear much too often.There are also some scenes with light non-moving dots in them but whether this is a camera lens problem that is permamently on the film or a print/negative problem(which in either scenario could easily be removed digiatlly)is unknown. In conclusion this is the best transfer of this movie to date onto DVD.The set is filled with many wonderful features including a great bio of the producer and many behind the scenes look at the making of the film.